The two Huskies of Hockey East hit the ice together for the first time since last year's Hockey East championship game in a home and home series this weekend. - The two Huskies of Hockey East hit the ice together for the first time since last year's Hockey East championship game in a home and home series this weekend. Northeastern knocked off UConn, 2-1, in the meeting at Matthews Arena, earning its first ever WHEA Tournament title. Northeastern also took the 2017-18 regular season series between the two programs, posting a 2-1-0 record through three games last year. - #3 Northeastern enters this weekend after closing out its regular season series with #10 Boston College last weekend. They defeated the Eagles, 4-1, on home ice before dropping a 7-5 decision on the road. The Huskies edged out the Eagles on the year, posting a 2-1-0 record in three meetings. • Senior Kasidy Anderson (Shaker Heights, Ohio) tallied three points on the weekend, netting two goals and dishing out an assist to push her point streak to seven games (7g, 2a). - UConn comes into this weekend after extending its winning streak to six games with two victories over Hockey East opponent New Hampshire, ending a 7-0-2 run for the Wildcats. The Huskies shutout the Wildcats, 2-0, on Friday, before skating to a 4-1 victory on Saturday. - Forward Natalie Snodgrass (Eagan, Minn.) found the back of the net three times in the two meetings to extend her point streak to five games. During that span, the sophomore has found the back of the net nine times and dished out one assist for 10 of her 23 points this season. - Merrimack and Maine close out their regular season series this weekend as the Warriors host the Black Bears for two games. The two teams met for the first of their three-game set on November 2, with Merrimack skating away with a 5-1 road victory. - The Warriors are back on home ice this weekend after splitting a two-game road trip at Vermont. They defeated the Catamounts, 5-1, in their first meeting, before dropping a 5-4 decision in the match up between the two teams in regular season play. - Mikyla Grant-Mentis (Brampton, Ont.) lead all NCAA players on the weekend with six points in the two outings, earning Hockey East Player of the Week honors in the process. The junior netted two shorthanded goals and dished out an assist in Friday's victory, before adding two more helpers in Saturday's loss. She was also named the NCAA's Second Star of the Week. - Maine continues a four-game road swing this weekend after taking three points in league play at Holy Cross. The Black Bears played the Crusaders to a 2-2 overtime draw last Friday before bouncing back to shut them out, 3-0, in their second meeting. The two games concluded the three game Hockey East series between the two teams in Holy Cross' inaugural season in Hockey East, with Maine taking the series 2-0-1. - Providence plays host to New Hampshire for a two-game home stand to close out the regular season Hockey East series. The Friars currently lead the series 1-0-0 after earning a 1-0 road victory over the Wildcats on October 28. - The Friars will look to bounce back this weekend after giving up four points in league play during a home and home series with Boston University. It was the first time this season that Providence was swept in a weekend series and just the second time they suffered back-to-back setbacks. - New Hampshire enters the weekend after having its seven-game unbeaten streak snapped by UConn. 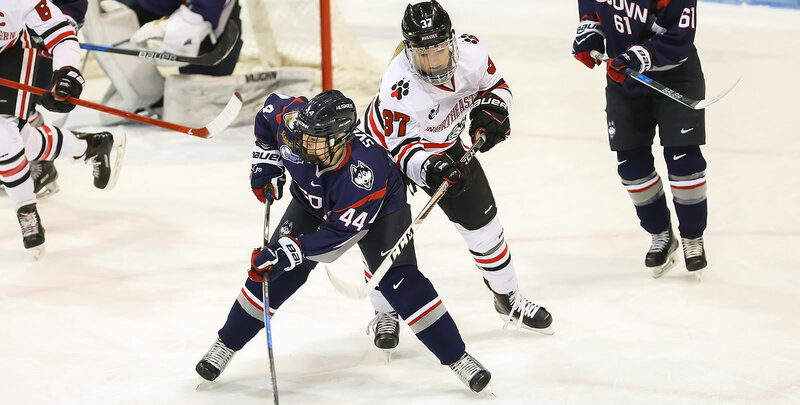 The Wildcats were shutout, 2-0, in their first meeting, before giving up a 4-1 decision last weekend to the red-hot Huskies who are now the owners of a six-game winning streak. - The Catamounts and Eagles prepare for the final two games of their Hockey East regular-season set at Gutterson Fieldhouse. Boston College owns the advantage in the series after shutting out Vermont, 3-0, in their first meeting of the season on October 20. - Vermont is back on home ice for the second weekend in a row after taking a 1-1-0 mark against Merrimack last weekend and own a 4-3-0 record in its last seven outings. - Senior Saana Valkama (Pirkkala, Finland) lead Vermont's offensive charge in Saturday's win, finding the back of the net once and dishing out two assists. - Boston College dropped its third straight game in a 4-1 loss to Northeastern on Friday, but rebounded to snap that slide with a 7-5 victory over the Huskies on Saturday. - Kelly Browne (Burlington, Mass.) earned Pro Ambitions Rookie of the Week honors after netting a goal and adding an assist in the Eagles' win. She also recorded 25 wins at the faceoff dot and put 10 shots on net in the two games. - Holy Cross and Boston University meet for the first time this weekend since the Crusaders became a member of Hockey East this season. - The Crusaders earned their first tie in Hockey East action when they played Maine to a 2-2 overtime draw on Saturday afternoon. Rookie goaltender Jada Brenon (Pendleton, N.Y.) recorded 36 saves in the effort. - Boston University enters the weekend riding a three game winning streak after taking four points in a home-and-home series with then-#7 Providence. The Terriers outscored the Friars 9-5 on the weekend, winning by scores of 5-3 and 4-2, respectively. - Corinne Schroeder (Elm Creek, Man.) earned her second consecutive Hockey East Defensive Player of the Week award for her staunch defending over the weekend. She turned away 58 Providence attempts en route to the two victories, lifting the Terriers to an 8-5-4 record and into a tie for third place in the Army ROTC Hockey East Standings with the Friars. The junior was also named Women's Hockey Commissioners' Association National Goaltender of the Month for her efforts over the month of December.